Reduces pain caused by patellofemoral instabilities by dispersing energy across the knee. Sizes: Available in sizes: XS/S, M/L, and XL/XXL and XXXL. Click on Size Chart tab above for sizing info. Take the measurement of your thigh 6" above your kneecap using a flexible type tape measure. Use the diameter to choose your size. XS/SM 13" - 18 1/2"
M/L 18 1/2" - 23 1/2"
XL/XXL 23 1/2"- 29 1/2"
Few months ago..I torned my acl during badminton tournament, jump smash and landed with one leg(left). A month ago i had the acl reconstruction, so will this brace help? for badminton will this brace give enough support? and can it prevent acl injury? This brace is not designed to support the ACL. It was designed to assist and support the patella with tracking issues. I'm a rower and I have serious pain in both of my knees. On the sides and above my patella. My physical therapist said that I have weak hips and because of them more problems have been caused. My diagnosis for my knee pain is patella mal-tracking, my patellas track medially inwards and I need braces to push them out. I tried the DonJoy Reaction Web Knee Braces, but they bunch up so much in the back that I can't get a long enough stroke in and they only helped a little. I need full mobility that would allow my knees to be fully compressed. Would ANY brace work for me? Since you have medial tracking issues, you would order the strap to track your patella laterally. How heavy are the braces? measure 21 1/2 will m/l do? You would be a M/L (11-0215-3). Can I find this specific brace in stores? If so which one I need it as soon as possible. No the Reaction cannot be bought in stores, however you can order it through Better Braces and have it overnight shipped to you. You would have to place the order immediately if you want it shipped out today. Because of the holiday, our next overnight shipments won't go out until Monday. Will this brace control a patella that dislocates laterally? Can it be used without the sleeve effectively? Yes this brace can be used for Patella Subluxation. The sleeve is there for comfort, it is not necessary for the brace to be effective. Do you guys sell the black pad separately? We sell the brace and the undersleeve toghether. You can buy another undersleeve. I have plica syndrome and have had surgery to remove the tissue in one of my knees. I currently wear a bulkier brace and am about to start college soccer. Would this brace fit with my injury and my level of play? The Reaction Knee Brace is used to help the Pateklla track through the knee's range of motion in a natural fashion. Hi,i have this brace and I use it during volleyball because I have patella dislocation in both knees however the brace has torn down the center.Is there some type of warranty to replace the brace with a new one? The Reaction has a 6 month warranty. Please call customer care at 1-800-553-6019, they can help process an exchange. Can this brace be used in watersports? I have tendonitis under my knee and MCL pain, my knee also pops easily would this brace help my knee and good for playing sport with? Yes the Donjoy Reaction knee brace is sufficient for your condition and activity level. i have been diagnosed with patella femoral syndrome in both knees. Supposedly no arthritis at age 59 per doctor review of X-RAY. Been taping, doing therapy for 7 weeks with PT supervision. I play 6 hours of singles tennis every week . Pain level has deminished 50% since therapy but is definitely not gone. Still feel it up and down stairs, sitting in a restaurant. What brace do you perscribe to help me and why? The Donjoy Reaction Knee brace would be appropriate for you and your condition and activity level. Is this brace left or right specific? The brace can be worn on either leg. My son plays high school basketball and he has been diagnosed by with patella instability which causes him a lot of pain. I am looking for a brace for both of his knees which will help his pain. What brace would you recommend. The Reaction knee brace would be appropriate for your son or the DonJoy Tru-Pull Lite. Both knee braces will help with patellar instability problems. The Reaction is also designed to distribute shock and force around the knee away from the painful areas. He might find a bit more relief while wearing the Reaction compared to the Tru-Pul Lite. I have a Donjoy Reaction brace and it does work well for my mild OA but I am expierencing migration down my leg with the lycra sleeve. If I wear it with out the sleeve It eats into my skin and is very uncomfortable. I also have tried a neoprene sleeve brace and it will not stay in place. Any suggestions. There is a 90 day money back guarantee if the product is not working for you. For OA you may want to try the OA Fullforce if you are an athlete. Otherwise, the OA Adjuster or the OA Everyday (with no joint instability) would be recommended. Hi, I have knee tracking problems in both knees. 2 1/2 years ago I had microfracture, meniscus repair, and a lateral release on the right knee. I have a meniscus tear in the left knee. I am a tennis player and am experiencing soreness in both knees about an hour into playing and after I play. Would this be a good brace for me? The Donjoy Reaction Knee Brace will provide support around your knee cap and moderate support to the knee in general, if you are getting a lot of instability or buckling of the knee joint you may want to try the Donjoy FullForce knee brace instead. That's best for athletes who have knee instability. I am 13 years old and play all sports. Track season now and summer I play a little softball and volleyball. I have Ogsgood-schalauters in my knee and was told I had arthiritis in my knee. I hurt my knee during the 200 sprint relay about a week ago and is giving me excrutiating pain. Would this be a good brace to have for all sports? Is it easy to run in? Light weight? Yes the Donjoy Reaction Knee Brace would be recommended for your condition and activity level. Hi, I am 12 years old with Osgood shlatter and play lacrosse and football and was wondering if this brace would work for a contact sport? Yes the Donjoy Reaction knee brace would be recommended for your condition and athletics. Does the undersleeve come with this brace when you order it? 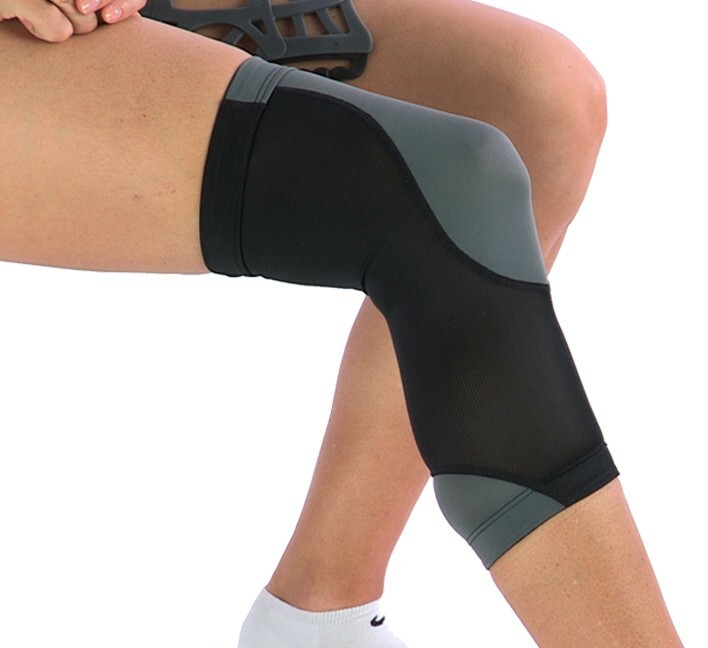 Yes, one undersleeve comes with the DonJoy Reaction Knee Brace. We offer replacements if you ever need a second one or would like to have an extra while the other may be in the wash. I am 48 year old female and walk 30 minutes a day. I used to run, but knee pain has limited me to walking or other non-weight bearing exercise. I have been using Hypafix and Leukotape to correct a patella tracking issue. This has been very helpful, but I was looking for something more long term. Would you recommend the Lateral J or the Reaction? Thank you! The Reaction Knee Brace would be recommended for your condition and activity level. My daughter plays high school soccer. Braces cannot have exposed metal parts, is this brace legal. She has chronic patella tendonitis, with her kneecap not being on track, will this help aleviate the pain? Yes this brace is appropriate for soccer, there is no exposed metal. The web design helps with patellar tracking and will distribute shock and force across her knee as opposed to one area. I am a male currently on a professional stunt team (like collegiate cheerleading) and a competitive cheerleading team where I do a lot of stunting (tossing and holding one female standing in my hands over my head) and tumbling. I have had my ACL reconstruction once and scoped twice (meniscus tears). I have no stability issues in either knee, but both knees (specifically above and below the knee cap) have pain during and after these activities, patellar tendinitis, and osteoarthritis. Patella straps help some, but I have to wear one above and below the knee cap and add tape to get more coverage in both areas...this looks like it would provide plenty of pressure all around the knee (which is pretty much what I do with all the tape). I know I will never be pain free but will this help relieve some of that pain? Yes the Donjoy Reaction Knee Brace would be recommended for you with your condition and activity levels. My 12 year old daughter has multi-directional patellar instability and Osgood-Schlaters. She has had her fat pad (ligamentum mucosa?) removed.We have this reaction brace, but it irritates the bump on her knee where the patellar tendon is pulling away and she won't wear it. I would like a support that has a little room for some growth. What do you recommend? The Tru-Pull Lite or the Deluxe Donut may be better options for her to consider using. The Reaction, Tru-Pull Light or Hinged Lateral J would all be good options because they all have lateral patella buttresses to keep your knee cap in place and hinges to protect your MCL. I am now wearing the <a href="/donjoy-oa-adjuster-3-knee-brace">OA Adjuster brace</a>, and have been for two years. I have osteoarthritic in my right knee. Will the progressive pain relief brace help me better with the pain I am still having when I move around. If you are still having pain and are already in an offloader this may not give the most relief for you. It may help some with the shock absorption, but will not offload any area. My daughter dislocated her patella playing volleyball. The ortho has recommended this brace. The players usually wear their kneepads just below the patella to help them slide when hitting the floor. The webbing on the front looks like it would prevent sliding, and maybe cause more injury? Would she be able to wear a kneepad over the brace? What's the best fix for volleyball? Yes, I would advice her to wear a pad over the webbing. The webbing will prevent her from sliding. Another good brace for dislocations is our Tru-Pull Lite. I note that it isn't designed for PCL injuries, however at the web design at the front of the brace look like it would aid in pulling the shinbones forward while reducing the force of knocks to the front of the knee. The main benefit of the Donjoy Reaction knee brace is the relief at the knee cap and patellofemoral stress reduction, not PCL stability. i will be playing college football for the next 4 years. and i was just wondering about the overall durability of the DonJoy Reaction Knee Brace for practice and weightlifting use; how long would it last? There is a 6 month warranty and that is how long we verify that the product will work. I have a pcl injury. This product look like it wuould aid in bringing the shinbones forward and take pressure off my pcl, while providing some protection to the front of my knee to prevent further injury. Is that the case? I play semi contact sports so I cannot use the ligament braces because they may injure other players. No the Donjoy Reaction Knee Brace is designed for Patellofemoral injuries not for PCL injuries. Actually the Armor would be the best Off the Shelf PCL brace for contact sports, you may use a sports cover to protect your teammates/opponents. My Son suffers from patella tendinitis and Osgood-Schlatter disease would this brace be a good one for him to wear during his high school football games as a linemen? Yes, this is a good brace for him to where for both of those knee conditions. It will help with the discomfort he gets, as well as still be functional enough for him to still move around in. My measurement is 18-18.5" at 6" above mid-patella. Do I go high or low for a better fit? Go with the M/L size. Is this the correct brace for that?? Yes, the reaction brace would be good for that condition. If she ends up thinking it's too much brace, you can try the Donjoy Cross Strap as well. The hinges are made of a flexible plastic. I have severe minicus tears in both knees and I need a brace that keeps the knee from dislocating with any twisting movements. I have arthritis and overall degeneration..Ive had surgery's to correct some of the damages(acl repairs,etc), but no knee replacements yet...this brace looks like it might offer me fairly good overall support. Im I correct? The the DonJoy Reaction Knee brace is mostly used for Patellofemoal issues, i.e. patella tracking, patella dislocations, & tendonitis, just to name a few. With the injuries and issues you have going on with your knees, and if you are active, I would recommend looking at a more sturdier brace that will protect from dislocations, ligament problems, arthritis and degeration. The brace that I would recommend would be the OA adjusted, it will help protect the ACL you have had repaired, as well help off load the torn menicis that you have, and with the strapping and extension stops available, this brace will help prevent against hyperextending the knee. True to size, I was thinking of getting the Small based on other reviews of the Velcro overlapping but I got the M/L size based on the sizing chart and there's no overlapping even though I was more on the Medium side. I bought this for water sports (surfing & swimming) in the ocean for a patella that subluxates. The brace does a good job keeping my patella tracking normally. My first use was for an ocean swim without the sleeve and the bottom right corner chafed and tore my skin, so I'd recommend using the sleeve for rigorous use. Would probably be ok without the sleeve for normal walking use. I wore the brace over my wetsuit for surfing. I'm still getting used to the brace so it felt a bit weird at first over the wetsuit and I had to readjust the straps a few times as the brace warmed up and got a bit softer and started slipping down. Overall great sports brace especially for the price range. The hinges look to be made of metal so make sure you rinse them out well after contact with sea water. Now that I'm fitting it correctly, it works well for allowing me to squat without patella pain, both during the exercise and afterwards. The enclosed instructions don't say that when you're near to the lower limit of a sizing tier, and the straps overlap at the back, it's important to strap the right top before the left top, and the bottom left before the bottom right, so that the overlapping sections have a velcro grip. Otherwise, the velcro more easily comes loose, and you can injure yourself like I did when it ripped open when the knee had a jarring flex. Excellant brace which feels unbulky light and works! Great light weight brace which is super comfortable and gives some spring in your step. Cons: straps are easily worn down, the sizes go from to small to too big for me. The sizing really is that large! I'm a reasonably big guy, but measured on the low end of M/L, so that's what I got. The straps however overlap at the back, compromising the velcro grip, especially when the web warms up. The top of the web also buckles out rather than sitting flush to the thigh. I should have got the XS/SM. I won't comment on its effectiveness until I've used it for some time. However the support I'm getting may be compromised because I have to have it looser than I'd like to reduce the strap overlaps. Unfit 45 yo female...did the Inca Trail wearing this brace! The mental desire to be fit was there but my knee was letting me down! Found this brace being sold in a ski shop and gave it a go...haven't looked back since! Been doing high intensity interval training 4-5 times a week for 9 months (including box jumps and squats) and then managed to walk 5 days of rugged steps on the Inca Trail in Peru this year. Happy happy happy. Just buying myself a new one after 6 months of rigorous wear due to the Velcro issue others have mentioned. After a torn mensicus repair and suffering mild OA I started wearing the brace when doing exercise. Absolutely fantastic support without restrictions in movement. It fits comfortably and very light. Fantastic product. I am a 57 year old male who enjoys competitive socal squash. Over the past few years arthritis in my knee got to the point where I could no longer play due to debilitating pain for a week after the game. After reading reviews, I bought the DonJoy Reaction 6 months ago. I am back playing squash 3 times a week, moving better than ever and having little or no pain. Ok, I train everyday in martial arts, do lots of kicking and cardio work, particularly skipping. The Reaction knee brace has been amazing. I have an LCL tear to the knee and the same knee underwent reconstruction some years ago. The pain i have been suffering from for months all but disapeared immedately i started using the knee brace. It is comfortable to wear, easy to clean, and lets me continue in the daily activity i enjoy the most. I would recommend to any martial artist with a knee issue to try it.